This entry was posted in "Four legs good", Favorite Perfumes, My Stats, Single Note Exploration and tagged Diptyque, Eau Duelle, Le Labo, Mona di Orio, Tobacco Vanille, Tom Ford, vanilla, Vanille, Vanille 44. Bookmark the permalink. I don’t remember the original formulation of Addict (though I know that I tried it back then), but I completely agree about Angel. Vintage Dior Addict is so good. Someone on the same floor but a different function wore this; I didn’t know what it was until I asked her. Since then, some kind NSTer send me a decant and I also swapped for a small bottle. Good stuff! I have never tried Mona di Orio Vanille, but I love vanilla fragrances. I really, really love Mexican Black Flower (Dame fragrances). Thanks so much for the giveaway! Black Flower Mexican Vanilla was one of those vanillas that didn’t work for me (at least this time), but I agree that it’s a nice perfume. Thanks for the briefing on all these enticing vanillas. It’s especially helpful to know that you wore Eau Duelle in the heat, because I long to wear vanilla year-round and that’s usually hard to do. I haven’t tried Mona di Orio Vanille, but my absolute favorite is Nest Midnight Fleur, which is a very subtle oriental vanilla. Thanks for the giveaway. I didn’t realize it myself about Eau Duelle until I smelled it on my friend (to whom I actually gifted that bottle a year earlier). Since we usually go to Hawaii together, I didn’t have a chance to wear it myself until this year when we happened to vacation separately. One more Dyptique’s perfume that performs unexpectedly good in hot and humid weather is Volutes. Hands down my favorite vanilla is Nicolai’s Vanille Intense. Never thought of myself as a vanilla fan, but this one hits it just right for me. I’d love to try the MdO. Thanks! islandjavaguy, you’re in – #4. I didn’t try Nicolai’s Vanille Intense but I’ll remember the name for the future episodes. Ha! So you came to the “dark side”, so to speak :-) When you’re determined to study a note, you really go all out so kudos to your persistence in finding your perfect vanilla. If I had to choose one, and it is very difficult, my choice TODAY (because it is likely to change) is Indult Tihota – vanilla and musk, pure and simple. As to Spiritueuse Double Vanille, I am running low and clarissa from NST mentioned that Guerlain has a 20 mL refillable travel spray called La Goutte Parfumee and it is available in a limited number of perfumes. I requested SDV and Neroli Outrenoir from Suzan @ shopfranceinc and I am waiting for her to come back and invoice me. It is surprisingly affordable at $45 each plus shipping! Rusty either lwas scared of was ready to pounce on the Mona di Orio bottle. He is such a cutie! You have a very good eye: Rusty was hunting my hand under the bed cover (I was trying to level the bottle). In the next 5 seconds he did pounce – too bad I couldn’t take a picture of that. Tihota IS tooth-achingly sweet and I love it as is! Have you tried Ex-Nihilo Sweet Morphine? It is Sweet with a capital S and I love it as well. Nope, I haven’t tried it yet. Hello darling! You’ve been brave to venture out of your comfort zone by wearing only vanilla themed perfumes for basically a month! Very impressive indeed. I smiled when I read til the end and found out you managed to discover your perfect vanilla, that’s great! Bravo you! Enjoy that bottle of Mona di Orio. I should check if I have a sample of 1725: those notes sound right up my alley. I”ll be happy to decant you some from my bottle if there’s such need. I’ll keep your offer in mind, thank you, Lucas. I’ll try to get it here first. If no – we’ll see. I wouldn’t knowingly subject myself to testing cuminy perfumes. Blech! In my mind, MdO’s Vanille is a winter perfume. So maybe if it’s cool enough where you live it’ll work for you this time. It wasn’t easy to get him into these pictures :) But now I’ll reward him with a treat for your compliment. I love reading about vanilla perfumes because it’s one of my favorite winter notes. I didn’t like Vanille Absolumente but I do love Vanilia by L’Artisan and luckily still have some left in my bottle as it seems that one is no longer in production although I think it was available for a while. I’d love to be entered for MdO Vanilla, I’m pretty sure I tried it and had a decant but for the life of me I can’t find it anymore (or remember how it smelled). My last vanilla addition was Jeroboam Insulo – I really love the darkness of that perfume. I had to do the search – I’ve never heard about Jeroboam Insulo before (which isn’t a surprise with the number of new brands and releases every year). Lovely post, thank you. Your relationship with vanille resembles mine, and my break through and still number one favourite is Mona di Orio’s Vanille. I came across the roller ball travelset for a good price and was instantly smitten. I also really enjoy Hiram Green’s Voyage which has a vanille note. And I love Yves Rocher Vanille Bourbon showeroil, cheapest of thrills, better than Vanille Noir. No need for Mona as I have a while to go with my current supply. Thank you, Hamamelis. I’m glad we have a favorite in common. Do you like any other perfumes from that travel set? I should check out that shower oil – it has been a while since I ordered anything from YR. Yes, very much. Eau Absolue which I adore, Rose Etoile, which is a sister scent to Nahema, and Ambre which is a very soft powdery amber. Vanille and Eau Absolue are my favourites. I need to find and test Ambre: I remember liking it when I smelled it in MinNY several years ago, but I was so overwhelmed at that time that I never actually tried it on skin – and since then I didn’t come across this line. Thoroughly enjoyed your vanilla exploration, Undina. It’s fun to go on one of those and you found your favourite! Unfortunately the grassy note in Vanille bothered me too much. I found Vanille Insensée masculine for some reason. I didn’t like Vanille Absolument,, being rather thin with an unpleasantly sour tobacco note. My favourite so far is Vanilla Smoke by Aftelier Perfumes. I’ve always hankered after a smoky, rubbery vanilla but never clicked with Bvlgari’s Black. Thank you, Tara. I forgot I had a sample of Vanilla Smoke as I was trying all other vanillas – I would have included it as well. But I tested it again since: it is very nice but it still reminds me of another perfume, which I like very much. I’ll reveal the identity at some point after additional testing. Do you have the Parfum (in the screw top dabber) or the atomizer EDP. The EDP smells like band-aid to me. I have the parfum (care to guess from whom I got the sample? :) ). It smells rather nice on my skin. I can send the remaining sample back if you somehow missed trying it. I wasn’t sure which one you got. Gorgeous, isn’t it? In my case, it’s because my bottle of SDV is gone (bought in 2007 when it first came out) and I’m exploring to see if I want to replace it or if there is something I like better. So far nothing has come close (lots of vanilla extract of no interest or worse, cotton candy). I’ll try your suggestions and some of the others mentioned here. Welcome, Rappleyea (and you’re welcome :)). If you’re looking for a new vanilla, you should definitely try the set that I featured in the Part 1: it’s very affordable and has many different vanillas in one set. Or, if you do not find anything better than your favorite SDV, you could try getting a 20 ml travel bottle of it (if you decide to do it, ask me or hajusuuri for the contact of the person who brings it from France to the U.S.). I’ve already planned to order that sample set! A shiny stone for your enabler’s pin! ;-) And thanks but Clarissa @ NST forwarded me the newsletter. I almost can’t help but to spend money! I have not tried Vanille but on your recommendation I will seek it out for a sniff, and Tobacco Vanille as well. Thank you for sharing your musings, they are fascinating glimpses into your thoughts. I find vanilla wonderful in fragrance as I adore scents that smell delicious but not edible. It’s a fine line. One scent that works like this for me is Vanille Galante. It smells very vanilla to me, and delicious, but does not smell like food. It is funny that when I’ve asked friends and family to smell Vanille Galante then tell me about it I get responses like booze, tobacco, lilies, flower shop, and even cupcake. Now, when you mentioned it, I’m surprised I do not have Vanille Galante sample… Have I even tried it? I need to correct that oversight! Vanille and Tobacco Vanille are very different, so you might end up liking one and hating the other. But you should definitely try to smell both. Meanwhile, you’re in the draw – #8. Well, Steve, maybe you’ll change your mind once you retire to somewhere warm ;) MdO’s Vanille is much less sweet than SDV. I’ll include you into the draw (#9), and you can always forgo the prize. I hope to test Arbole soon: everybody’s raving about it. I used to be obsessed with finding a vanilla perfume. My favorite is probably Annick Goutal Vanille Exquise. Super easy to wear. I haven’t tried either of your favorites! I tried Vanille Esquise many years ago, and back then it didn’t leave any impression. I wonder how I’d feel about it today. Is it even in production? (Unfortunately, our local stores carry an extremely limited line-up from the brand. Akuokuo, thank you for the suggestion. I am a card carrying vanilla lover and my favourite vanilla is Felanilla by PG. I have tried the MdO one at the latest Perfume Lovers London meet, and liked it reluctantly. :) The Eau Duelle I remember from a sniff at SpaceNK, but that was years ago, and I will give it another try. Please do not include me in the draw. I re-tried Felanilla recently and liked it very much. I wish PG was easier to get by in my area! One of your commenters who mentioned Annick Goutal Vanille Exquise as a favorite reminds me that another vanilla favorite of mine is Annick Goutal Vanille Charnelle (though I think it is priced rather steeply … it is a far more simple perfume than MdO Vanille, at least in terms of smell). Suzanne, thank you once again – I love-love-love this perfume (and plan to re-use your beautiful atomizer as a purse spray – not that it really requires re-application). And I agree that the new bottle looks more elegant than the original one (thought I admit that the original one was also very interesting). I was very impressed with the quality of the bottle when I got it. I wish though they would make a smaller size as well: even 50 ml would have been much more practical (and a 30 ml bottle would be extremely cute!). I see that you can get Vanille Charnelle for $133 online – which is practically free nowadays! Too bad shops in SF do not carry most of AG’s perfumes. But maybe I’ll break my no-buy rule and get a couple of AG’s samples – thank you for the recommendations. Have you tried Saks? I remember smelling the AG Vanille Charnel there. I bet your Saks is… “saksier” than ours :) The last time I went there a couple of weeks ago I saw about 8 regular AGs (plus 3 colognes). But I’ll take a closer look the next time I happen to go there. Oh missed this, as am away at the moment, but vanilla is hands down my favourite note. I do like Vanille, though it is quite far along the ‘treacly spectrum’ so I have to be in the mood for it, typically in winter. I would put Angelique Noire in that category too and that’s a fave. Another vote for Vanille Galante, Felanilla and Vanille Exquise, Black Mexican Flower, and Bvlgari Black. I am wearing DSH Cimabue a lot out here in freezing cold Germany, and I think I appreciate the vanilla in that. Since you’re not protesting, I’ll assign you #12. I should definitely wear Bvlgari Black tomorrow! I planned to but then got distracted and went with vintage Miss Dior parfum: it’s great but I think I would have felt even better in something “warmer” – it’s chilly here as well. 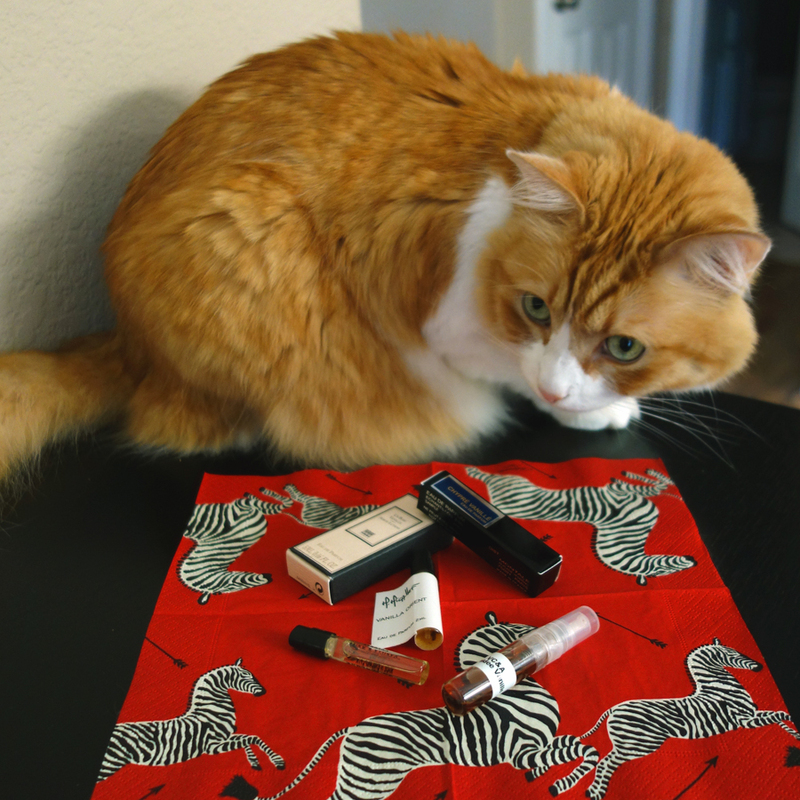 I love how dubious Rusty looks about vanilla perfumes. This is actually a tough one, I do own Bvlgari Black and wear it on occasion, along with Shalimar (but not at the same time). If I could stretch my wallet a bit, I’d love to have a decant of Vanille 44 :) So I guess my answer is, no, I clearly don’t have one hands-down favorite vanilla. I have not tried the MdO yet, but I’d love to give it a sniff! Rusty was very excited: I let him into the bedroom (the only place where it was enough light to take a picture of my new bottle). Seconds after this picture was taken he jumped trying to catch an invisible pray (my hand) under the cover. I wouldn’t be too hopeful about Couvent des Minimes: I haven’t tried (or even heard about) it but at that price range just there’s no chance it’ll be really close to SDV. So try it if you get a chance to do it for free but do not spend money on a blind buy. 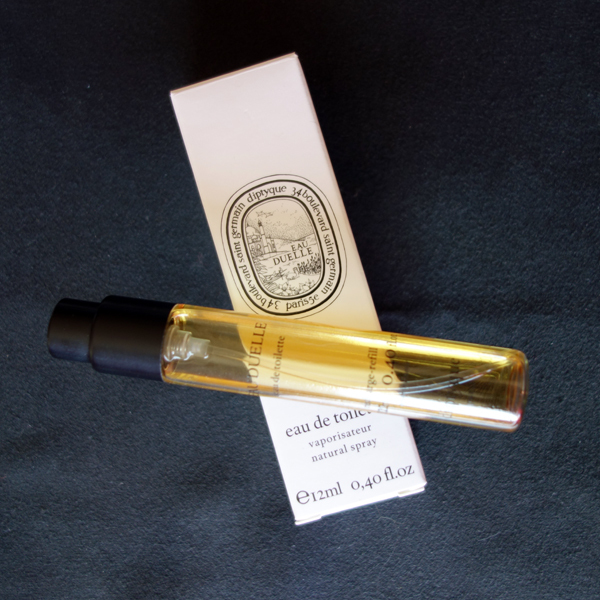 How is it that I’ve never sent you the Couvent des Minimes Eau de Missions? I would not necessarily call it a deadringer for SDV but it is close, especially the portion that have had a chance to get aerated and become more concentrated. chocolatemarzipan8, it’s nice to see you here. You’re entered under #15. Good luck! I had blindly bought a bottle of Serge Lutens Un Bois Vanille two years ago and while I didn’t dislike it I didn’t love it either, so I kept neglecting that bottle. That up until a couple months ago that I decided to spray it on. It was nothing like I remembered (a very bland vanilla) it was the most amazing smoky vanilla scent I’ve ever smelled! I have no idea if this is because the perfume has aged beautifully or my nose has changed but I know I love it now! As of the Mona di Orio Vanille, it’s something that I’ve been wanting to try. It might be any number of things. First of all, blind buy based on reviews and/or list of notes are just a recipe for a disaster: in our head we create a picture of perfume that is almost impossible to top by real scent. And the disappointment from the scent that didn’t meet your expectations is so strong that it stays with you for a while. But since this time you approached it without any expectations, and there was nowhere “lower” to go, from this point any positive feeling would carry a much more positive energy. Then, of course, your nose kept developing through these couple of years, and you can better detect nuances of the scent. I’m not sure about the aging playing a positive role in perfumes, so I won’t know one way or the other. But I want to add one more possible factor: weather. The temperature and humidity might make the same perfume both behave and smell differently. You made a point about expectations that I’ve never had considered before and you are so very right! I’m not in the habit of blind buying perfume often but that one seamed a safe choice and I was eager to smell it. I was wrong obviously but still it ended up a good choice after all, it just took a while! Favorite Vanilla? Well Guerlain children! I do love Plus Que Jamais which is tobacco vanilla and yummy. Vanilla Smoke is really really nice though.